Charlie Hebdo is my Hero! Charlie Hebdo did it. He did what every Free Speech loving person across the world should be doing. He flung the middle finger at the rioters and murderers who are trying to rob the Free World of it’s Liberty. Hebdo published a series of cartoons basically ridiculing Mohommad and Islam just days after Muslims started behaving like mindless Stone Age monkeys in the streets of every major and many minor cities across the globe. Some folks will whine that he is endangering the public. That’s nonsense. He’s endangering no one. The Governments of the World who are allowing Muslims to behave like animals are to blame. The Muslim Governments of the World who are NOT prosecuting the animals rioting in the streets and murdering non-Muslims are to blame. The Muslim Officials who are persecuting non-Muslims and Muslims alike for blasphemy are to blame. A cartoon is a cartoon. If you don’t like it, don’t look at it. A movie is a movie. No one is forcing Muslims to view that or any movie. If you do not like these things, ignore them. If you do not wish to see offensive items, close your eyes and plug your ears. Muslims have no right to tell the rest of the World how to think. They have no right to censor me or you or anyone else. It’s bad enough that they kill each other in their own lands with impunity. It’s bad enough that they murder and persecute and oppress minorities in their own countries. What are we if we allow them to persecute, oppress and murder us in our own lands. Sharia should never be allowed to expand into Western Nations. That would be a TRUE BLASPHEMY! Why do people deny so much of the obvious and so much of history in order to speak well of religions such as Islam and Christianity? Are these people incapable of comprehension? Are they illiterate? A religion of peace does not participate in conquest. A religion of peace does not commit genocide. A religion of peace does not require blood sacrifice. How are genocide, conquest or blood sacrifice considered peaceful? The Jews committed genocide throughout the Old Testament. 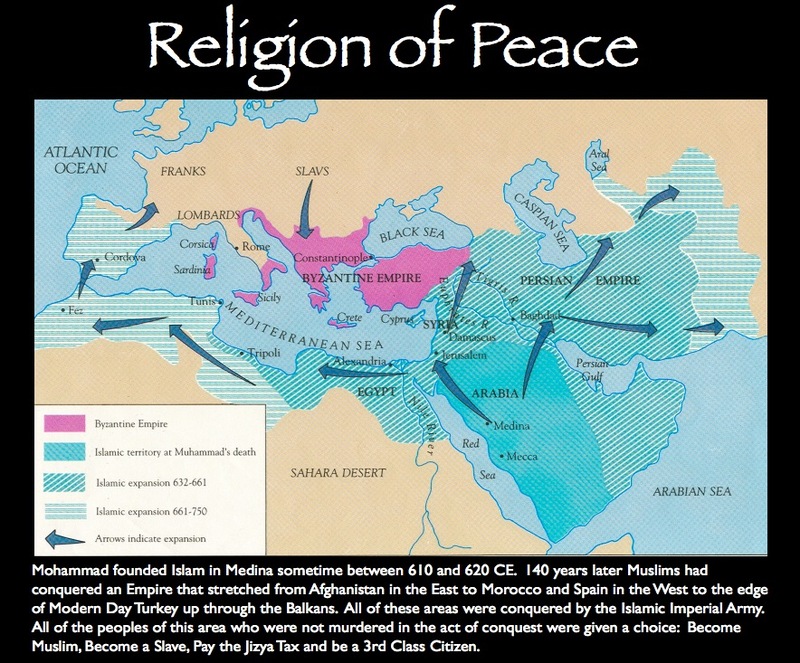 Islam is a Imperial Religion that used Allah as justification to conquer lands from India to Spain and back again. Christianity is a religion whose God required a sacrifice of blood in order for it’s adherents to receive their eternal reward. This is all violence. This is not peace. Christians love to say that Jesus died for their sins. NO! Jesus was violently executed for your sins. 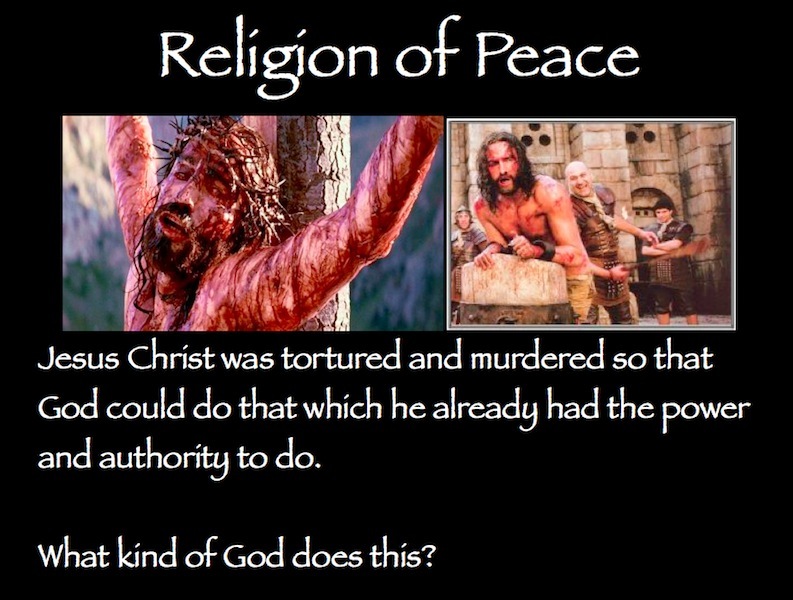 And you call that peace. As part of a revision to defamation legislation, the Dail (Irish Parliament) passed legislation creating a new crime of blasphemy. Update: The bill went to the Seanad on Friday, July 10, passing by a single vote. This attack on free speech, debated for several months in Europe, has gone largely unnoticed in the American press. The text of the legislation is provided at the end of this post. How does this impact free speech? Just don’t be rude. * Atheists can be prosecuted for saying that God is imaginary. That causes outrage. * Pagans can be prosecuted for saying they left Christianity because God is violent and bloodthirsty, promotes genocide, and permits slavery. * Christians can be prosecuted for saying that Allah is a moon god, or for drawing a picture of Mohammed, or for saying that Islam is a violent religion which breeds terrorists. * Jews can be prosecuted for saying Jesus isn’t the Messiah. Is it really THAT big a deal? Ireland’s Blasphemy Bill not only criminalizes free speech, it also gives the police the authority to confiscate anything deemed “blasphemous”. They may enter and search any premises, with force if needed, upon “reasonable suspicion” that such materials are present. * The local Freethinkers society, with its copies of Hitchens’ God Is Not Great: How Religion Poisons Everything. * The video store, with copies of The God Who Wasn’t There. * The history teacher, who uses The Dark Side of Christian History to teach her class. * The library, with its collection of books deemed blasphemous. * Even the homeowner who lets the wrong person know he has a copy of Salman Rushdie’s The Satanic Verses could find his door broken in by the Thought Police, his bookshelves ransacked, and his books burning in the front yard! Satirizing religion in any way, shape, or form, if it “causes outrage”, is now a prosecutable offense in Ireland. Saying anything negative about a religion, if it “causes outrage”, can now be prosecuted as a crime. Just like in Muslim countries. Witness the return of the Dark Ages.